Well it's finally happend. 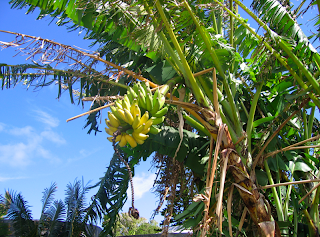 Our first bunch of BANANAS has become ripe and we are chowing down. 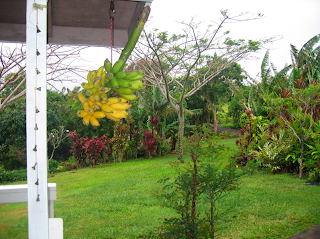 We were told that as soon as 1 banana turns yellow to cut it from the tree and hang it up somewhere near the house. This way the birds and bugs will not devour it on the tree. I cut this bunch down yesterday and just the bottom "hand" was yellow. 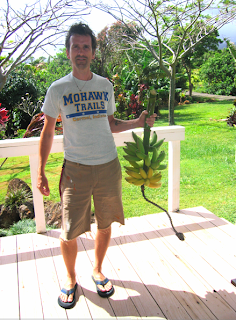 I hung it from a hook off the lanai to ripen and today 2 of the 3 "hands" are yellow. They were quite tasty this morning with coffee. Each one measures about 4" in length and 1.5" in diameter and are packed full of sweet flavor. I need to find out exactly what variety this is... could it be apple banana, or vanilla banana? 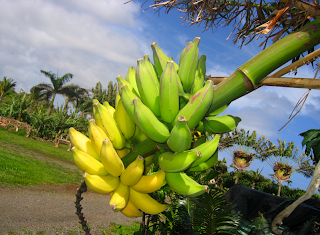 I do know that banana's grow on plants and not trees. This particular bunch has/had 62 bananas on it. We have about 8 more bunches ready to turn in the next few weeks. I see banana bread, banana splits, banana smoothies and more in our future. 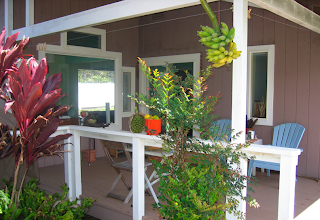 The ripening station on the lanai yesterday. More yellow as of this morning. Venus was said to enjoy them you will too!! 5738 Long Ridge Place, Indpls, IN 46221...we wouldn't want to waste these tasty treats!!! looks soooo gorgeous there!! i love your baby blue deck chairs admiring your bananas. make something good!